You are at:Home»Herbs»Areca catechu Linn. Latin name : Areca catechu Linn. The dried nuts possess antimicrobial properties and are anthelmintic, antiinflammatory, antiseptic, aphrodisiac, appetiser, aromatic, astringent, constipative, cooling, digestive, diuretic, emmenagogue, nervine tonic, sialagogue and stimulant.The powdered nuts are prescribed in chronic diarrhoea and dysentery. Also useful in urinary disorders, anorexia and general debility. Promotes menstrual flow and lowers blood pressure. Chewing the nut is a good source of fluoride. Also expels roundworms and tapeworms. Powder of betel nut is used as a constituent in some tooth powders. 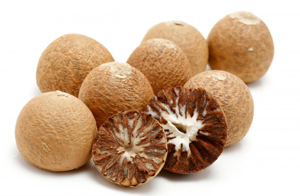 Other medicinal uses include the removal of tapeworms and other intestinal parasites by swallowing a few teaspoons of powdered betel nut, or by taking tablets containing the extracted alkaloids. Kramuka finds its commonest use in mouth freshner formulations in India through aegis. Its use has also been recommended in the prevention and treatment of obesity. It improves salivation (Sialagogue). Nutritional analysis of the nuts suggest it to be a richest source of organic chromium salts. The role of chromium in the metabolism of fat has been well established now through various studies. Recommended Dosage : 1 to 2 g powder of nut. Contraindication : This herb is contraindicated during pregnancy or lactation. Also contraindicated in asthma due to its bronchoconstrictive effects. Toxic dose for humans is 8 to 10 g of the drug.